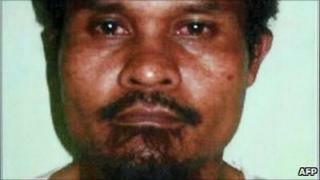 One of Indonesia's most-wanted Islamic militant suspects has been arrested at his home, police say. Abu Tholut, 49, is suspected of helping to set up a militant training camp in Aceh province, recruiting militants and raising funds for "terror activities". He is also suspected of plotting attacks on foreigners in Jakarta and the assassination of political leaders. Tholut, who has served jail time in the past for explosives offences, was held without a fight in Kudus, Central Java. "Abu Tholut was deeply involved in terrorist training in Aceh and armed robberies in North Sumatra province," national police spokesman Boy Rafli Amar told reporters. Anti-terrorist unit Densus 88 arrested Tholut, who is also known as Mostofa, Pranata Yuda and Imron Baehaqi. The authorities have made a series of arrests linked to the discovery of a militant training camp in Aceh in February. Among the highest-profile arrest was cleric Abu Bakar Ba'asyir, who for decades has given spiritual leadership to many of Indonesia's radical groups. It is thought Tholut and Ba'asyir have been associates for many years. Tholut, who fought with the Taliban in Afghanistan during the 1990s, is suspected of providing military expertise at the Aceh camp. The Aceh group was allegedly plotting a Mumbai-style attack on foreigners at luxury hotels and several high-profile assassinations, including President Susilo Bambang Yudhoyono. Police are also linking Tholut to a bank robbery in the city of Medan earlier this year, which they say aimed to raise funds for militant groups. In 2004, Tholut was jailed for seven years for the bombing of a shopping centre in Jakarta but was released in 2007 for good behaviour. In the past, the former medical student has also been accused of establishing training centres for groups with links to al-Qaeda in the Philippines. Indonesia has suffered a number of bomb attacks over the past decade - many of them linked to the Jemaah Islamiah (JI) group. The police believe many of those involved in the Aceh camp were disaffected former JI militants. Analysts say JI militancy has been on the wane for some time, and the authorities are now more concerned with splinter groups. Indonesia's worst militant attack came in 2002 when two nightclubs in Bali were bombed, killing 202 people, many of them Australian. Are Indonesian terror networks regrouping?